Trista Hudzik grew up in North Carolina, Studied ceramics at Haywood Community College and has taught at Penland and Asheville-Buncombe Community College. Using a complex recipe of layers of textural slip, hand painting, color resist and hand carving, each piece of Trista’s has its own unique and expressive quality. 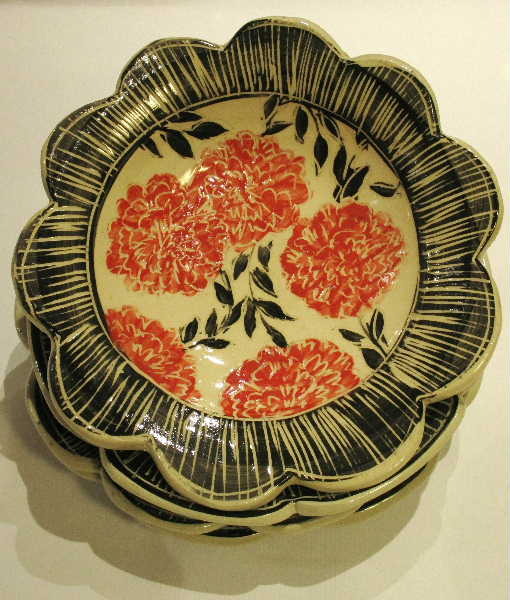 She uses North Carolina stoneware, and high fires in an electric kiln. The resulting pottery is functional and may be used and enjoyed every day. Trista is a tender & passionate painter, her canvas being clay. There is such exuberance in every piece she creates, fun touches of nostalgia, color texture and shape….making every use a sweet moment to savor. Her inspiration is mismatched antique china, vintage fabrics and her festive garden…. North Carolina clay, electric-fired stoneware. Fully Functional.